Steve Swasey, VP of Corporate Communications, here. Terrific response to our news today about Netflix on the iPad. For those of you asking whether Netflix will be on the iPhone and iPod Touch: We wouldn't invite you to dinner without planning to serve dessert. In other words, we're working on it so stay tuned. Netflix is one of my favorite methods for streaming movies and catching up on TV series I hadn't watched before, like Heroes, which I just started watching. I was curious if 'maybe' Netflix might have released the iPhone version sooner than people thought, so thought I'd search the App Store. 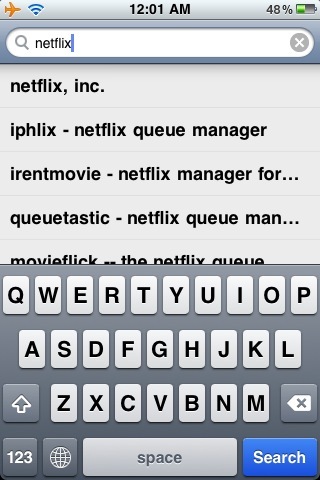 Even if it wasn't there, there might be any new Netflix queue management apps for the Phone I want to check out (I currently use PhoneFlicks). So I searched the App Store on my iPhone and Lo and behold, I saw a new one called 'netflix, Inc."! Hurriedly, I clicked it to install. But unfortunately, all I got in return was "No Matches". Oh how my hopes were dashed. How could you do this to me Apple? That's just cruel man! I'm guessing perhaps the bank-end database for the iPhone and the iPad app stores share the the same database but certain apps are flagged as iPad-compatible and some apps are flagged as iPhone-compatible. But perhaps there is some bug causing this iPad-only app to display. Or it's possible Netflix for the iPhone has reached the final stages of approval and is about to be released. Though, I've never seen any app appear on my iPhone's app search that wouldn't install. Very fishy and a very cruel tease! I want my Netflix for iPhone app and I want it now! Netflix App Arrives for iPhone and iPod Touch! I was also in the same predicament! It's great that iPad will be getting some Netflix streaming love, but what about the iPhone? I'm wondering how good the streaming quality will be once they get their act together.